Over our frequent interactions with internal ITs, we see significant lack of knowledge what IT Quality Management is. Traditional logic of Quality=greenSLA is coming from the world of external service providers, where this approach is working well, inside organization this must evolve to more holistic approach. Improving KPIs of unsuitable process doesn’t make sense, it’s better to change and adapt the process rather than sticking to outdated process flow and 3 years old documentation that passed audit then, or ITSM tool flow which is defined that way many years ago. Culture, thinking, approach of people will need to reshape from “this is how we do it” to “ïs there better way of working?”. Ideas for adaptations, improvements must be captured, evaluated in a systematic way, supported with quantification mechanisms and ability to show benefits delivered. Visual Board provides tangible presence of functional quality improvement culture. This is what IT QMS does. 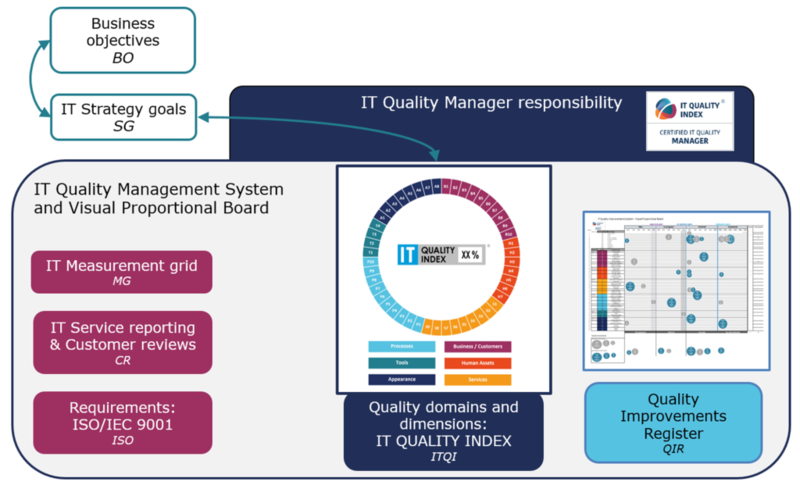 IT Quality Index is resource efficient method how to understand the big picture – measure IT quality in the form of one figure. Based on this IT department can discuss with management what is the next direction. Improve Quality, reduce costs, find suitable balance? IT QMS in combination with IT Quality Index is great help to more adaptive management, when resources used for certain activities (i.e. SLM) could be released to support improvements somewhere else i.e. bring more structure to innovations. Example of IT QMS and its key parts is visualised on the next picture, which is taken from IT Quality Manager course.